To me, Labatt's Shock Top is the kind of beer that if it was personified - he'd be that douchebag bro who would call you bro every 13 seconds, drink all your beer and still go "bro, it's your fault, you had free beer just sitting there in the fridge", and he wears socks with sandles and plays music on his phone's speaker instead of using headphones, that kind of douche. Shock Top's essentially Labatt's take on the Rickards brand in Canada. As you can probably tell by now, Molson has pretty much cut advertising money for the prairies - so beers like Rickard's White are getting replaced by Shock Top Belgian Wheat. So due to that, everywhere that used to serve Rickard's has moved towards Shock Top. I've refused to review Shock Top for the most part because frankly.. I don't like their beer: It's watered down, syrupy and doesn't hold a candle in the wind compared to craft beers, or even RICKARDS.. sadly enough. I reviewed their Raspberry White last year and after trying that beer.. I don't know why people like it.. but perhaps it's the advertising or just that people think it's a craft beer when it's not. 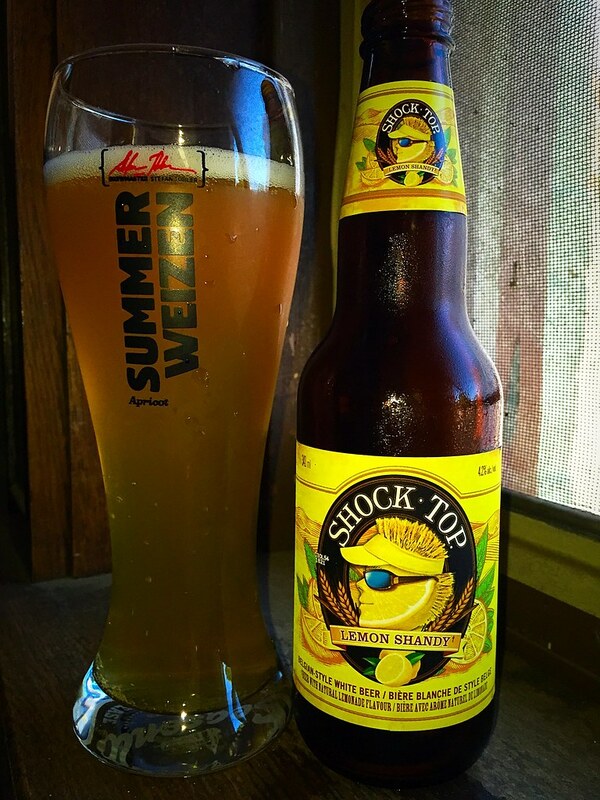 Appearance: Shock Top Shandy pours a very pale cloudy lemon yellow. Reminiscent to a typical shandy or Radler but lighter than I'd expect at 4.2%. There's an incredibly light amount of beige head on top rimmed around the side of the glass. Aroma: Lightly sour - lemons, a bit reminiscent of Mill Street's Lemon Tea as it's a tad sweet. There's a chemically aroma that's very much like baby wet wipes. Light breadiness.. I don't know what else to say.. Taste: Fairly sweet - especially compared to the aroma. Lemon water with a few tablespoons of sugar or corn syrup. Light grainy bitterness from the malt. The more I'm drinking this, I'm noticing more and more of faux lemon juice extract. Overall Thoughts: Lemon, lemon, lemon, lemon. Hint grainy bite but lemon. It's incredibly easy to drink on a hot summer day like today.. so that's good, but lemon. Appearance: It pours like your typical Belgian witbier, a very cloudy & murky orange with a hint of copper coloured ale. Decent amount of white creamy foam fluffs at immediately but it quickly goes down. Aroma: A bit grainy - bready, hint of lemon, coriander and a hint of orange peel. This is very underwhelming.. it's grassier smelling than most witbiers. I think the Lemon Shandy might have been just a bit stronger in aroma. Taste: Grassy, a bit metallic bitterness, a flavour that reminds me of the vinegar in Heinz ketchup, lemon, light on the coriander and oranges here. Actually a slight bit bitter. Really underwhelming.. but it is 5.2% ABV, so seeing how light it tastes, you will eventually get a bit of a buzz. Overall Thoughts: I'm surprised that this is as popular as it is in Canada. While Rickards White is faux with its overly sweet orange notes and the overabundance of coriander - the coriander in this beer is minimal at best.. especially with the label mentioning it as part of the flavours. 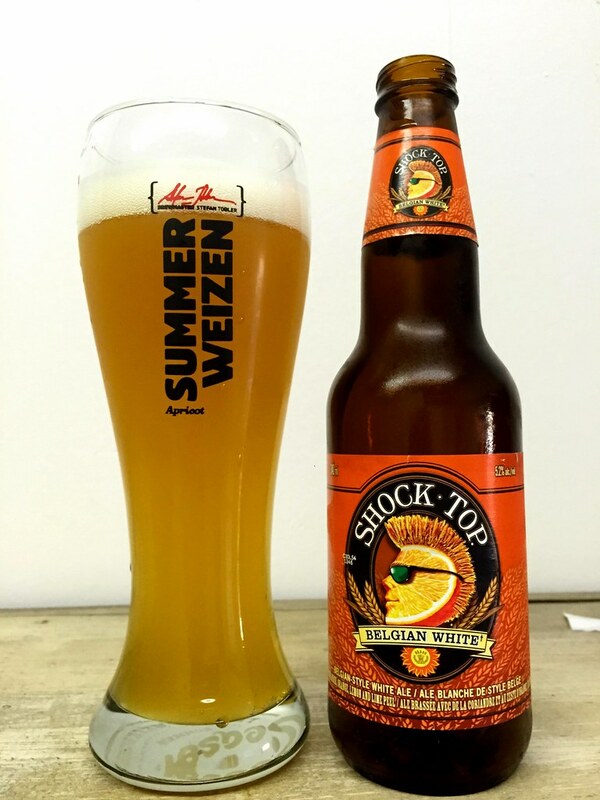 We have to remember that Shock Top is part of the very same company that makes Goose Island Sofie Saison and Hoegaarden - both are amazing wheat ales. This one is bland and truly needs orange wedges to give it some flavour. Belgian? Nope.. I don't recall Creston or Vancouver being part of Belgium. But this is a white, not a good white.. but yeah.